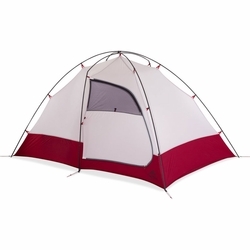 MSR Remote 2 Tent. A strong, four-season refuge for two mountaineers, the Remote 2 tent offers the protection you need with the livability that keeps you levelheaded for days or weeks in the harsh alpine. Built to withstand fierce winds and heavy snow loads, the double-wall tent features a sturdy central-support frame and nearly indestructible Easton® Syclone™ poles. Reinforced guy-out points provide reliable tension, and snow flaps seal out spindrift. With its spacious interior and gear-harboring vestibule, the Remote 2 tent becomes a secure haven when you’re hunkered down on the side of a mountain.